Since my family is on a No Spend Week it’s going to be about using what’s up in the fridge/pantry (I should do this all the time anyway, but I seem to be acutely aware of it now that I can’t use my wallet). This is especially true for produce. How much gone bad produce do you throw out weekly? This time I tried to curb that issue. How? Bundle of Celery, left over cream (from last week’s Mac & Cheese), milk (that my kid’s still need to use up), and spices…. 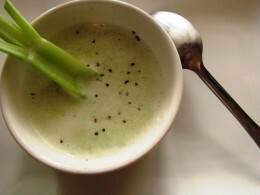 Make a batch of Cream of Celery Soup! And I am quite proud of myself with this recipe because it came out tastin’ like the stuff you buy. Well, actually better. 😉 Plus I had enough to store two individual containers in the freezer to use for my lunches this week. Happy Me. So, what yummy meals are you havin’ this week? This entry was posted in The Daily Grind on 2009-06-14 by Christine. You can eat out? The menu sounds great! Fridays mark the start of a new pay period. Chicken salad is one of my favorites! My roommate recently got a book of chicken salad recipes (tip: using avocado instead of mayo makes it healthier!) and I’m really excited to start putting some of them into my meal plan. You should check out springpad’s weekly meal planner, it’s a great way to organize all of your menus and recipes (like this one, yum! http://bit.ly/3D6top) and I think you’d really like it. @ Rachel: I just looked at springpad’s WMP and it looks delicious! Thanks for the info! not only is my food bill cheaper when i plan my meals, but i eat much healthier as well. if i know this, why am i such a slacker at it? btw, prepare an extra plate for today and tomorrow … yumm-o. oh wait, assuming the enchiladas are chicken or veggie, me no eat beef;-). … what’s your chicken salad recipe? i had some with tarragon (i think) and it was delicious. i haven’t been able to duplicate it. lastly, have you tried vegenaise, it’s suprisingly good. i get it from whole foods. http://www.followyourheart.com/vegenaise.html. @ Ms. MoneyChat: seriously cheaper and can be on the healthier side. You call yourself a Slacker at menu planning, huh? Cuz it takes planning and planning takes time… no time? All which I do not seem to have enough of either. But when it comes to meals I have to make time or I loose my sanity when I come home scurring to figure out what is for dinner. Unhappy Mom makes for an unhappy home. LOL. @ MoneyMonk: Thanks. Hopefully, I will try a new recipe next week. @ dinah: Thanks. Actually, I guess I could get more wordy like Pepper Jack, Bacon Cheeseburgers. lol. Hey, I need some family friendly meal ideas. What is a typical meal at your home?